If you could go back in time 50 years, how would you describe the internet? Let’s take a look at what people viewed on YouTube, Wikipedia and Twitter in 2014 to see if there is any truth to this joke. YouTube: What did we watch? There is now 6 billion hours of footage on YouTube. What clips are most popular? Music videos. 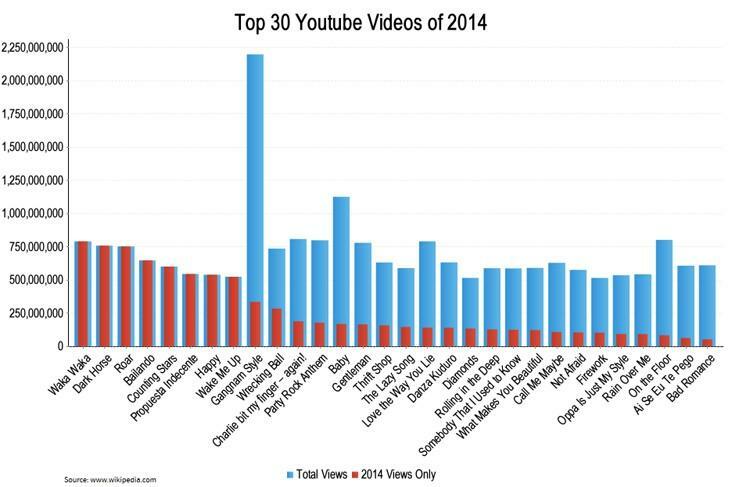 The top 8 clips were all hit songs in 2014, but “Gangnam style” (2012), the most watched YouTube clip of all time, still made the top 10. Psy also has two other hits in the top 30 – “Gentleman” and “Oppa is just my style” – making him the King of YouTube. Justin Biebers “Baby” music video is the only other clip to join the 1 billion views club. Twitter: Who did we follow? There are millions of amazing people in the world. But in the 21st Century, its celebrities and entertainers we worship. 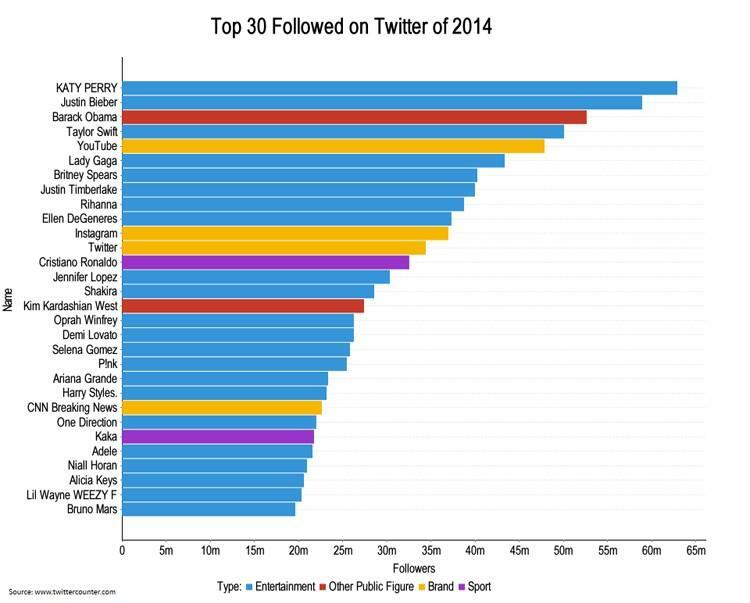 22 out of the top 30 Twitter followers are entertainers (excluding Kim Kardashian who we couldn’t bring ourselves to label an entertainer). 20 out of those 22 entertainers were musicians. Barack Obama was the only person who is not an entertainer or an athlete to make the list. Wikipedia: What did we research? With 35 million different articles on Wikipedia, our most popular topic to research was “Online Shopping”!!! People are clearly interested in mortality, with “Alive” and “Deaths in 2014” making the top 4. The death of “Robin Williams” and threats to life such as the “Ebola virus disease” also made the top 20. 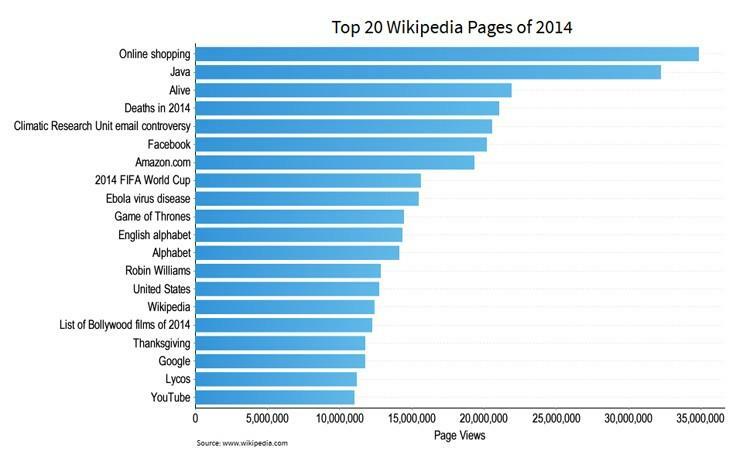 Website giants were another popular topic with Facebook, Amazon.com, Wikipedia, Google and Youtube all making the Top 20 viewed pages in 2014. What are your thoughts? We’d love to hear from you. You can chat with us on Twitter @yellowfinbi or our LinkedIn group.